Ideal for display and presentations. 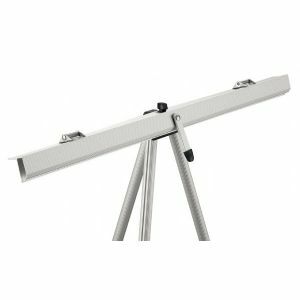 Lightweight aluminum tripod easel with telescoping ¾" tubular leg design with 2-stage quick-release locking leg mechanisms and non-skid rubber feet. Doubles as a tabletop easel. 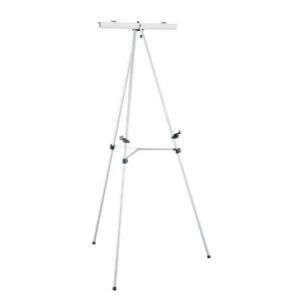 Features include a flip chart holder, a central cross-bracing for added strength and rigidity, and lower canvas/board clips to support multi-purpose surfaces when not used as a flip chart. Height is 63" when fully extended, 34" in its lowest position, and folds to 36" in length for transport or storage. Accommodates canvas/display boards from 3" to 30" in height and 1" thick. One year limited warranty.